Building on what we discussed last week, today we will be looking at how to strengthen the ankle joint to help prevent painful sprains from happening. Strengthening the muscles surrounding the ankle joint can also help to improve performance in a variety of activities because many land-based activities will require that you are upright, on your feet and putting a great deal of stress on the ankle joint. Three big components of ankle performance program are strength, mobility and proprioception. Strength is fairly self-explanatory: increasing the strength in the muscles themselves by adding load to the ankle joints. Mobility refers to the range of motion available to the ankle joint; restrictions can cause issues and muscle imbalances. Proprioception is the ability of the body to recognize where it is in space and in relation to other joints in the body. Proprioception has a lot to do with balance as your body needs to be aware of where, say, the torso is, in relation to the ankle joint. If it is in good alignment, you will be able to balance for a longer duration. If it is not in good alignment and leaning too far in one direction, this can cause you to lose balance, and possibly to roll over your ankle joint which is what we are trying to avoid. 1. Ankle range of motion: with foot elevated, alternate pointing the toes, flexing the foot, and rolling the foot in a circular motion in both directions. 2. 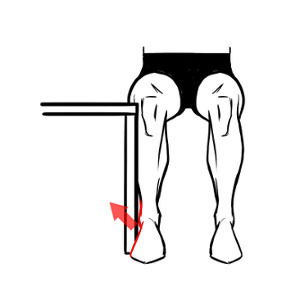 Achilles stretch: with both toes pointed towards the wall, place one foot forward and one foot back in a staggered stance. Keep the back knee straight and you’ll feel the stretch more in your calf (gastrocnemeus muscle – the bulky part of your calf). If you bend the knee of the back leg, you’ll feel the stretch closer to the ankle joint itself (soleus muscle). See photo below. 1. Single leg balance: proprioceptive exercises can start as simply as practicing balancing for a period of time on one leg. If this feels easy, try standing on a balance disc, pillow or other unstable surface. Try adding some hand-eye coordination practice by tossing a tennis ball either at a wall or to a partner with one hand – harder than it sounds, but will help add the hand-eye coordination needed for many ball sports. 2. Lateral hops: when you’re feeling really comfortable on one leg, give these a try. You can place a piece of tape on the ground as a marker if you’d like. Practice taking off and landing on only one leg. Move your hops back and forth (lateral motion) and complete sets on each of your legs. 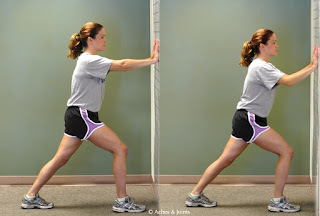 These double as a strengthening exercise, but also mimic the quick direction changes found in many sports while cutting in ball sports like soccer or ultimate, or changing directions in raquet sports like tennis. 1. Heel walks: often times the calf muscles and the muscles of the back of the lower leg get so much attention that we neglect the muscles around the shin, such as the tibialis anterior. 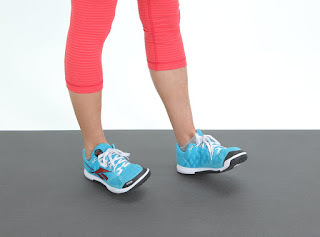 For heel walks, lift all the toes off the ground so you are supporting yourself on your heels. Walk forward about 20 paces, rest, then repeat. 2. Calf raises: everyone loves a good calf raise, right? Standing flat, slowly bring your heels up off the ground as far as you can so you are supporting yourself on the balls of your feet, hold for a few seconds at the top then slowly lower down. For an added challenge, try rising on both feet, transferring your weight to only one foot at the top, then lowering only on that one leg. You can also try rising and lowering on only one leg at a time or try a different stance (wide legs, or with one leg in front of the other). 3. Resisted eversion: you can do this one with either a band or a wall/table/other stable vertical surface. If you’re using the wall, sit on a chair right next to the wall, with the outside edge of your foot touching the wall. Push outward against the wall and hold for a few seconds, then rest and repeat. See photo below. If you’re using a band, you can tie one end of the band around a stable surface, such as a table leg, or have somebody hold one end of the band with the other end looped around your forefoot. Push outward against the band, hold, then rest and repeat. 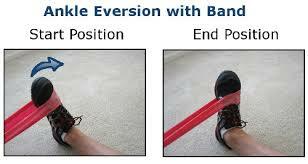 For each of these eversion exercises, you should feel the muscles along the outside of your ankle and on the outer edge of your calf working. So there we have it, some ideas of exercises to improve your ankle strength and sport performance. We rely on our ankles a great deal, as we are on our feet much of the day. These are of course only some ideas. If you’re looking for more exercises, we suggest making an appointment with your physiotherapist who can give you a more individualized program.